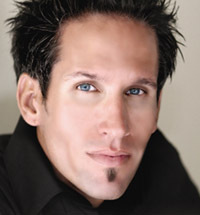 Jason P. Lester is one of the world's finest physically challenged extreme athletes, winner of ESPN's 2009 ESPY Award for Best Male Athlete with a Disability, and an accomplished artist. 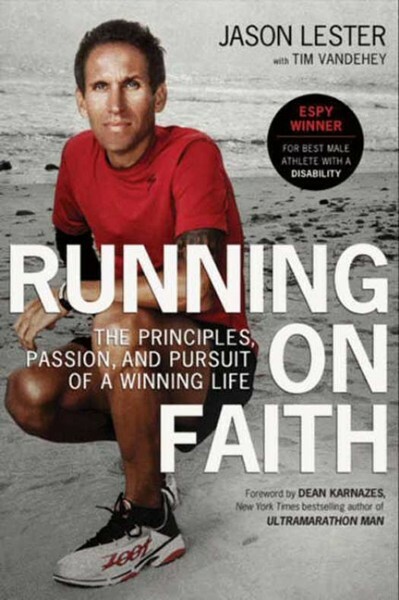 His memoir, Running On Faith: The Principles, Passion, and Pursuit of a Winning Life (HarperOne), co-written with Tim Vandehey with a foreword by Dean Karnazes (New York Times best-selling author of Ultramarathon Man), is his story of triumph as an Ironman with the use of one arm and his guide to overcoming adversity, reaching goals and recognizing God's guiding hand in one's life. As an evangelical Christian, Lester shares his message of hope and faith through his NEVER STOP Foundation, speaking engagements at companies, schools, hospitals, churches, and athletic organizations. His experience in the HawaiiUltraman World Championships is being made into a 90-minute documentary, A Painted Race. Also in production is a feature film detailing Lester's extraordinary life, titled Chasing Me. In his Running on Faith talks, Lester shares the nine lessons that led him to achieve his dreams and find his calling. He lives these lessons every day, doing everything to the best of his ability, with intense drive and passion. Providing audiences with the tools to overcome the adversity they may face and pursue their passion, Lester demonstrates a practical and inspirational guide to never giving up in the game of life. In his 36 years Lester has survived more trials, endured more horrors and surmounted more obstacles than would fit in a Hollywood film. After each upset, letdown, and setback he has recommitted himself to pursuing his dream of becoming an accomplished athlete, despite his challenges. Lester grew up in Arizona, where he became obsessed with sports as a coping mechanism and by age 12, developed into a skilled athlete with numerous accolades. As fate would have it, he was hit by a car while riding his bike, resulting in 21 broken bones, a collapsed lung, and a paralyzed right arm, stifling his dream of excelling in sports. As Lester was slowly leaning to adjust to his disability, his father and sole guardian died at the age of 39. Still, inspired by the memory of his late father's love of athletics, Lester grew up to become a star in high school and college athletics. By the age of 16, he was competing in running and biathlon events. After participating in countless races, including 5k, 10k, biathlons and marathons, Lester was ranked #2 in the state of Arizona in biathlons at the age of 18. The turning point in Lester's athletic career came from a visit to the Big Isle of Hawaii. He stumbled upon the 2004 Hawaiian Ironman Championships taking place in Kona and it was there that his spirit was totally overcome by the awe of this race. He felt re-energized and came to believe that this was his life's calling. With a goal to race the Hawaii Ironman Championships himself, Lester began a rigorous training schedule. While he continued with the intensive workouts in preparation for his first big race, the Arizona Ironman, Lester began to notice something truly amazing - he was regaining movement in his paralyzed arm. Today, Lester lives and trains in Hawaii. He has competed in numerous extreme races, including the Arizona Ironman, Western Australia Ironman, Hawaii Ironman World Championship, Canada Ultraman, Hawaii Ultraman World Championships ,and most recently EPIC5, where he completed five iron distance triathlons on five Hawaiian Islands in less then seven days. He's been profiled in numerous print and online publications including Competitor Magazine, West Hawaii Today, USA Triathlon, ESPN Radio, Inspiration Journal, Ironman.com and AOL's Everyday Athlete Spotlight. Lester achieved a personal and sports milestone by becoming the first physically challenged athlete ever to complete the Ultraman World Championships in Hawaii on November 30, 2008, finishing the ultra-distance triathlon where he swam 6.2 miles, biked 261.4 miles and ran 52.4 miles to the finish line. In the year leading up to the 2008 Ultraman World Championships, Lester raced in three Ironman competitions including the Ironman World Championships, represented the USA in the Triathlon World Championships, and completed Ultraman Canada. It was in realizing God's presence in his life that Lester was able to overcome each obstacle, while continuing to train and push forward with his eye on the goal. With all of these experiences, Lester has dedicated his life to motivate and move others to reach for new heights. A successful athlete, artist, and activist, he knows firsthand what it is like to be faced with countless challenges as a child, both mentally and physically. Now an adult and Ironman triathlete, Lester uses the forum of sports to inspire and motivate others, worldwide. His vision is to use his involvement in sports and passion for racing, as a platform in which to share his message of hope with all youth. In 2007, Lester founded the NEVER STOP Foundation, which is dedicated to using athletics as a tool to encourage all youth to have the chance to achieve their full potential. The goal is to help those in their formative years find their own true voice, help them build their confidence, improve their communication skills and learn the values of discipline, trust, compassion, self-reliance, and respect. Lester is also an accomplished artist. Both his father and grandfather were skilled artists, and Lester seemed to have inherited the same gift - a natural talent for painting. In 2004 he opened The JR Gallery in Manhattan Beach, California, featuring the works of new and established artists, including paintings from Lester's own collection. The gallery and art career flourished and he became an internationally acclaimed artist, with many of his works and private commissions being requested by the sports clients of his past.